The Araucana is a pure breed of chicken originating in Chile. The Araucana is often confused with other fowl, especially the Ameraucana and Easter Egger chickens, but has several unusual characteristics which distinguish it. They lay blue eggs, have feather tufts near their ears, green legs and yellow undersides to their feet. Conversely, the Ameraucana has blue-slate to black legs and either black or white on the undersides of the feet. The ancestors of the modern Araucana chicken were purportedly first bred by the Araucanians of Chile—hence the name "Araucana". 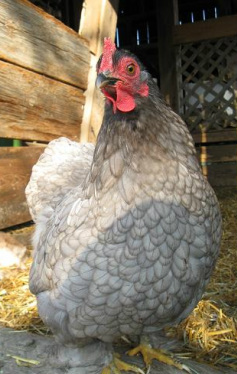 The tufts are unique to the Araucana chickens. The tufts are a group of feathers that grow from a flap of skin near the ear called a peduncle. The tufts gene is lethal when two copies are passed to the embryo, and the chick dies in the shell and does not hatch. So living tufted birds only carry 1 copy of the gene and that is why a tufted bird can have cleanfaced offspring. A cleanfaced bird is one that does not carry the tufting gene and cannot pass it on. Ameraucana chickens were developed in the 1970’s in the United States from Araucanas. 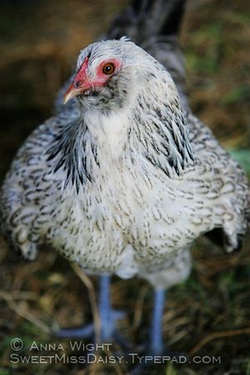 They were developed as a practical barnyard fowl that laid pastel shelled eggs, but without some of the limiting genetic factors related to rumplessness and tufts. Ameraucanas were admitted to the American Standard of Perfection in 1984. Cream Legbar chickens are an auto-sexing medium-sized fowl that are known for their active foraging and ability to survive in a free-range environment. Pullets are a soft speckled dove grey with contrasting soft salmon breast, and creamy feathered collar, their looks enhanced by a jaunty little hatIn 1952, seven legbar hens in England were monitored for a year. On the average they each laid 260 eggs. 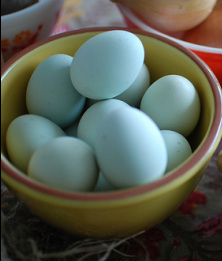 Cream legbar eggs are a pale powder blue eggoften deceptive in their appearance. They tend to be more spherical than most chicken eggs, and because of this they look shorter and therefore smaller. But, if you weigh the eggs you will find they nicely compare to other large egg laying breeds. Daily "Easter Basket" - No dye needed! Easter Egger (EE) chickens are "mutt" chickens which have Ameraucana or Araucana in their breeding however, they will also lay you a beautiful array of fascinating egg colors! As well as being friendly chickens that are a wonderful addition to any home flock. These are not a specific poultry breed, they're a hybrid variety of chicken which lays eggs that vary in shade from Green, Blue, Green-Blue, Sea-Green, Tinted (Pink). 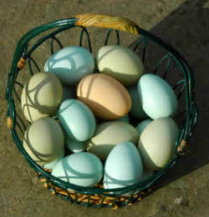 Easter Eggers vary widely in color and proportion and don't conform to any breed standard. You could call them mutt's really, as their lineage can vary widely. They are usually some derivative of Ameraucanas and Araucanas. However, pure-bred Ameraucanas and Araucanas are originally from South America and are American Poultry Association recognized breeds as noted in "The American Standard of Perfection". Olive Colored chicken eggs are fun! 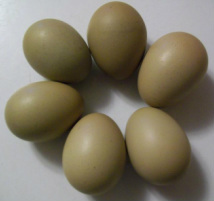 Olive Eggers (OE) are a variety of chicken that will lay an olive colored egg. These interesting chickens are created by crossing a bird hatched from a Dark Brown Egg (like Marans, Welsummers, Barnevelder, Empordanesa and Penedesenca) and a bird hatched from a Blue Egg (like Ameraucanas, Araucana and Easter Eggers). Generally speaking, if you want very dark olive colored eggs, you need to start with one parent who comes from very dark egg layers, such as Marans. However, Welsummers crossed with blue egg birds can produce offspring who lay a beautiful lighter olive shade, often with freckles. It's been noted that Olive Eggers can also be produced by a parent from a light tan egg crossed to a bird from a blue egg. With this combination, the offspring could give eggs in a very light minty green, a light teal green, or even a blue/green. As you can see, OE's green shade may vary widely from khaki, olive green, dark mossy green and deep olive green. Every color is interesting and a great to dress up to any egg basket. Olive Eggers and Easter Eggers can be quite an assorted bunch depending on their parentage. These lovely chickens come in a wide variety of colors and combs, feathered legs and clean legs, really big and not so big, muffed, bearded, or not, rumpless or big bottomed. Typically, you'll find them to be large fowl that are friendly and hardy; this makes them a great choice for a family flock. Most have a calm, curious, active temperament. All are great birds for your backyard or barnyard!